Channel 4 is showing a five-part TV series called Gods and Monsters, starting tomorrow evening. 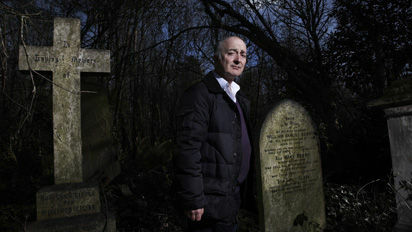 In it, Time Team veteran Tony Robinson (pictured above) is set to explore the history of belief, superstition and religious experience in Britain. Channel 4's description of the documentary series states: "For 2,000 years, Britain has been a Christian country. Or has it? In fact, our ancestors actually kept many other dark, fantastical beliefs alive. It was a world underpinned by outlandish, dangerous and plain weird beliefs. Ideas that today seem unbelievable, but were seen as uncontroversial and hugely influential, with some having shaped our history as much as mainstream religion." Although that doesn't actually mention paganism, it does rather seem to imply it is taking the attitude that pre-Christian beliefs were pretty much all dark and dangerous. Hopefully that won't be the case. The opening programme of Gods and Monsters is called The Undead. It examines our fascination with and terror of dead bodies, and beliefs that the dead could rise from the grave to cause havoc among the living. Apparently Tony's journey "brings him face to face with a plague-breathing zombie, a dead body that seems alive three weeks after it died, and the English monarchs who ate the bodies of their subjects". Could be interesting, but could potentially be offensive to pagans. I'll keep an open mind until I see it. Gods and Monsters: The Undead is being shown on Channel 4 at 8.15pm on Saturday 26 November. Does sound interesting. I read the article in the Daily Telegraph that you posted a link to, which seemed rather simplistic. I hope the programme will better explain where the evidence for these beliefs comes from. I don't think Pagans will be offended if the subject is treated seriously and no-one suggests that modern Wiccans fly around on broomsticks. A series on British folklore and belief is overdue and I'm looking forward to this, but Tony Robinson is irritating! Having watched the first episode about Celtic beliefs, I can't help wondering where he is sourcing his "facts" from as it seems complete conjecture to me. The Celts did not have a written language and the Roman chroniclers of the time were notorious unreliable and strived to paint indigenous tribes as being shamefully brutal. No one actually knows if the Peat bodies were sacrificed or victims of state punishment or murder. It is pure guess work that the Celts' ceremonies and religious beliefs looked anything like those portrayed in the "documentary". Rachel, I completely agree with you. The programme was sensationalist and questionable. I wrote my dissertation on Celtic and Romano-Celtic religion. Robinson's programme on pre-Christian beliefs was bilge from start to finish. There simply isn't enough time to take issue with all the factually incorrect items in it.